The shout cut Father Douglas like a sharpened cutlass. Boyo's voice was trained from years of hunting in the forest ... trained to pierce the densest undergrowth in an emergency. The closed wooden door of the vestry did not stand a chance against it. "Fadda, they say you home. You home?" Father Douglas was sorely tempted to answer "no, I not home". But his position as priest did not encourage such levity. And good priest that he was, he resisted temptation. "Yes Boyo. I'm here. Please push the door and come in." Two men entered the vestry. Boyo, the bolder, was bare-headed and almost bald-headed. Sahadeo, the older, removed his stained felt hat as a sign of respect. Father Douglas could never figure out whether the respect was for the Church, or for him. One day he would ask. But not today. Today he would accept the respect in the name of his Church, and in his own name too. Both men entered, but only one would speak. Father Douglas knew exactly what would happen. Boyo would speak, and Sahadeo would stand perfectly still until the conversation was done. Then Sahadeo would say "thank you Fadda, thank you" and both would leave. "Fadda, is about the parang." Father Douglas smiled. Boyo had one, and only one, claim to fame. He was the founder and sponsor of the "Tabaquite Compañeros" parang group. "Sponsor" meant three things. First, the group practised under his house (but with their own instruments). Second, they drank his rum sometimes. And third, he was going to collect the prize money if in case they ever won a competition. "Fadda, we planning a big fete this year to start the parang season. Is we tenth anniversary, and we inviting three-four sides from all over the country to help we celebrate. It go be in the savannah by the school, and we go sell food and drinks and everybody go have a good time." "When are you planning this celebration, Boyo?" Father Douglas had to know. It went without saying that a fete like this would want the Church's blessing, and he did not want it to clash with any other celebration of the Church. "Well, Fadda, we was thinking in the end of October go be good. Then we could go straight into the Parang Season. That is what we was thinking." Father Douglas was impressed. 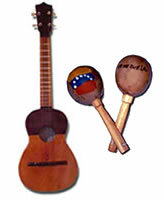 Tabaquite Compañeros was not reputed for early planning nor excessive practising. Yet here they were planning a celebration two months in advance. This was progress. Maybe his sermons and informal talks were getting through. "So, Boyo, you want to plan things early this time?" "Nah, Fadda. That fete ent going to take no plan. Is something else we come to see you 'bout." "And what is that, Boyo?" "Well, Fadda, Sahadeo son working Flour Mills in Town." The good Father had become accustomed to this round-about style of conversation. He waited. "Sahadeo son tell him it have a thing name Noise Rules now, and when they was having the Carnival Fete at Flour Mills they had to apply for a paper to play the music loud. He say it does cost $500, and it does take long time to get. And he say we go have to get one for we fete too. I tell him he mad in he ..."
Boyo paused. From childhood he had been told that cussing in Church - even in the vestry - was a bad sin. And he had only just avoided that sin. Thank God. Then he continued. "Well, I tell him he mad but he say no, is so things is now. So I come to see you to find out about this thing. We go need a paper to play we parang? You go help we get it?" Father Douglas had no ready answer. A Priest in a rural area received many queries in the course of a year, and surprisingly few had to do with theology. But this was a surprise even to him. He had seen little advertisements in the newspapers about people who wanted to have functions and were applying for noise permits. But he didn't really know what the rules were, and who should apply. "I'll have to make a few phone calls, Boyo. Then I will be able to tell you. Give me a few days." "OK, then, Fadda. I go see you next week." "Will I not see you tomorrow at Mass?" asked the Priest. "Well ... I go try Fadda. But you know how it does be!" Sahadeo now said his piece. "Thank you Fadda, thank you." True to his word, Father Douglas made a few phone calls on Monday, and then wrote a letter. I write on behalf of the Tabaquite Compañeros Parang Group, many of whom are my parishioners. Our community is very proud of the fact that this group will be celebrating its Tenth Anniversary this year. The group wishes to organize a day of fun and fellowship to mark this important milestone, and they are unsure whether they would need your permission under the Noise Regulations. As you can see, this group wishes to abide by the law. Please advise by return mail, and I will inform the group. Your enquiry on behalf of the Tabaquite Compañeros Parang Group refers. We at the EMA are heartened that this group wishes to obey the law, and that you are using your good offices as their spiritual leader to guide them accordingly. Please accept our thanks for this. Unfortunately, I am not now in a position to respond to your query concerning a Variation under the Noise Pollution Rules. The fact is that we at the EMA are required to view all enquiries and applications in a holistic manner. As such, we note with concern that the anniversary celebration by your parang group forms part of a larger activity involving significant earthworks, for which we have not received an application for a Certificate of Environmental Clearance. Our advice is therefore that you should apply for the Certificate of Environmental Clearance immediately. It is only after that application is determined that we can properly address the issue of your application for a Variation under the Noise Pollution Rules. Your response to my enquiry baffles and alarms me. I simply wrote to ask whether the local parang group needs a noise permit to hold a fete to celebrate their tenth anniversary. There is no larger activity. There will be no earthworks (significant or otherwise). This is just a group of villagers who wish to spend a day together enjoying food and drink and playing music. I am sure that there is some misunderstanding here, and I hope this letter clears it up. If you need more details, please let me know and I will be happy to supply them. Otherwise, please let us know whether we will need what you described as a Noise Variation under the Noise Pollution Rules. Thank you for your most recent correspondence concerning the your enquiry on behalf of the Tabaquite Compañeros Parang Group. There is no misunderstanding. Despite recent secular aberrations, parang is first and foremost a facet of the Christmas season. The EMA has documented evidence that the planners of the Advent envisage the construction of a large access road, to be effected by "filling up the valleys" and "levelling the mountains". This would constitute a Designated Activity under the Certificate of Environmental Clearance (CEC) Rules. Further, this road is to be built in the "wilderness". This we take to mean forested areas, which may very well constitute Environmentally Sensitive Areas and/or which may be habitat for Environmentally Sensitive Species. As such, we maintain our position that this overall activity requires a CEC. Please be advised that you may purchase a copy of the CEC Rules (2001) from the Government Printery. You may also which to purchase copies of the CEC (Fees and Charges) Regulations (2001) and the CEC (Designated Activities) Order (2001) to guide you in this matter. If I may be of further assistance to you, please let me know. We look forward to early receipt of your Application for a CEC. Your latest letter leaves me at a loss for words! You are quoting the words that are thousands of years old ... words spoken in Israel ... and you are speaking about a Major Prophet. How is this relevant to a fete by a parang group in Trinidad in 2003? To make things simple, could you please tell us whether we need to apply for a noise variation? That is all that we are asking. It is irrelevant to the process how long your plans have been in place. The Environmental Management Act (2000) is specific as to exceptions to the CEC Rules. Your larger activity would be exempt only if you had Outline Planning Permission from the Town and Country Planning Division or Full Approval from all other government Agencies prior to July 7, 2001 (the date when the CEC Rules came into force). It is equally irrelevant that the proponent of this project is a corporation originally founded in the Middle East. Their area of operations have come to include Trinidad & Tobago, and as such their activities in this country must conform to all of our laws, regulations and standards. Finally, the profitability of your proposed enterprise is of no specific relevance to the CEC Process. While we acknowledge that it is of great importance to you that you expect to make a major profit (please note the spelling of this word), the CEC will be decided on environmental grounds. I trust that this fully and finally explains the position of the EMA on this matter. We cannot and will not accept applications for individual components of a project of this magnitude in a piece-meal fashion. The matter of your Parang Group's Anniversary Celebration will only be addressed after the broader issues associated with Christmas have been properly approved. In closing, we would strongly advise that you purchase a copy of the Environmental Management Act (2000) along with the other documents which we identified in our last letter. All are available at reasonable cost at the Government Printer. The information in those document will enable you to better advise your client. One thing at least is certain. The Lord did not apply for Outline Planning Permission for the Advent. As a matter of record, there was neither a Government of Trinidad & Tobago nor a Town and Country Planning Division to receive such an application at the time. But in the interest of a speedy resolution of this matter, perhaps you could tell me how much a CEC would cost, and how long it would take to process. If an Environmental Impact Assessment (EIA) is not required, the CEC application will be determined within a period of 8 weeks. If an EIA is required, you will receive Terms of Reference (TOR) within 6 weeks, and the CEC application will be determined within 16 weeks of receiving your EIA Report. The CEC Application requires an application fee of $500.00, and there will be an EIA processing charge of $10,000.00, to be paid when you collect the TOR. I wish to reiterate that we see your change in position as a sign of real progress, and we look forward to receiving your application for a CEC in due course. I am now dumbfounded! Can you really be saying that we must spend more than $10,000.00 and wait for almost 6 months before you will even tell us whether we should apply for a Noise Variation? The fees you quoted are more than the anniversary fete will cost, and six months will take us far beyond the date for this event. After all, the world was created in six days! But perhaps we can compromise. Please tell us whether we need to make an application for a Noise Variation for the anniversary fete, and we will do so. After, we can consider the CEC application that you are asking for. The whole Christmas Season is the Lord's work, so I am sure that you will extend every consideration in this matter. We sincerely regret that you have seen it fit to renounce the progressive stance which you had taken, and revert to your original position. The EMA is unable to accede to your request for a "compromise". We have an over-riding responsibility to protect the environment of this country, and cannot permit small parts of larger projects when the larger projects have not been approved. Our position therefore remains unchanged. With regard to your claim that the world was created in 6 days, please note that the CEC Rules were not yet in force at that time. Had they been in force, a CEC Application would have been required, and an EIA would have been requested as well. Given the tremendous adverse impacts on the natural and human environments that have transpired since the creation of the world - impacts which would have been disclosed by a properly-prepared EIA - it is very unlikely that the CEC Application would have been approved. On another matter, we are disappointed that someone of your standing in this society should seek to exert undue influence on the decision-making process. The EMA strives to be even-handed in its work, and we do not consider the identity of the applicant nor the project proponent when deciding on applications. We will not treat your developer any differently from all of those who apply to us, and we certainly will not offer any special favours to anyone. You and Mr. Lord should be guided accordingly. Father Douglas sat in his vestry, re-reading yet again the file of letters before him. He could not understand what had gone wrong. But one thing was clear - he had let down Boyo and the Tabaquite Compañeros. They had come to him with great faith in his ability, and he had disappointed them. It all left a bitter taste in his mouth. Father Douglas leaned his head back and stared at the age-old marks on the ceiling. He closed his eyes and listened to the sound coming in from outside. It was the sound of joyously amplified parang music. For it was late October, and the Tabaquite Compañeros were warming up for the start of their tenth anniversary fete. In just a few minutes, Father Douglas knew, he would have to go out and make a small speech to formally start the festivities. "Prepare in the wilderness a road for the Lord! Fill every valley; level every mountain. and all mankind will see it. The Lord himself has promised this."